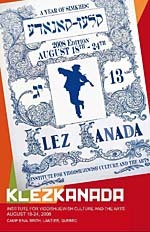 For 13 years Ashkenaz has brought the finest in Yiddish and Jewish culture to Toronto. To celebrate our ‘Bar Mitzvah’ year we have assembled a diverse and exciting festival lineup featuring more than 70 performances and 200 individual artists from a dozen countries. From music, dance, theatre, and film, to visual arts, literature, discussions, kids and family activities, and group celebrations like Havdallah and our famous Parade, Ashkenaz offers a wealth of artistic and cultural experiences for all the senses. The intermingling of tradition and innovation has always been the hallmark not just of the Ashkenaz Festival, but of the global Jewish community. This year, Ashkenaz once again presents a mix of traditional arts along with multicultural fusion bridging communities and artistic traditions from within and beyond the Jewish world. And while contemporary Klezmer music and Yiddish culture remain at the heart of our programming, we are thrilled this year to offer more Sephardic music and culture than ever before. In short, Ashkenaz offers something for everyone, a multi-cultural, multigenerational experience for Jews and non- Jews alike. What an amazing concert. We had a standing-room only crowd that seemed to consist exclusively of people who knew this music and loved it, and the musicians fed right off that in one of those wonderful loops where the music becomes incredibly good. They covered the gamut of folk music from Eastern Europe, and Steven contributed a generous helping of material from Stempenyu's Dream. This lead to the delighful anomoly of a concert that ran the gamut from Walt singing a Balkan drinking song to Steve getting the whole audience to join him in a concert-closing catharsis singing his "Yah Ribon." I tried out two new recorders, one digital audio (but got only one channel), and one DAT (had to boost amplitude, and kept forgetting to turn it on). The DAT recording is now in the Internet Archive (thank you Steve and Walt) for everyone's pleasure. And, of course, if you like this, you have only to visit Steven Greenman's website for more. (The Harmonia Band website appears to be down—not sure where to pick up their wonderful recording on "Traditional Crossroads"). It's a bad sign of how busy I've been (grant applications at work, board meeting at work, final paper for class) that it's been two weeks since I posted here. But, the news today is just a reminder of that post--tonight Steve and Walt appear: Steven Greenman+Walt Mahovlich Eastern European Folk Traditions The Lily Pad 1353 Cambridge st., Inman Sq, Cambridge, MA 7pm, $10 www.lily-pad.net 617 395 1393 It's a small, kid-friendly venue near lots of great restaurants, and a bit of a walk from the Central Square T stop. We got a nice mention in today's Boston GLOBE "Sidekick" section (erroneous, but nice, and featuring Steve's picture). Please pass the word on, and do come--it would be great to convince them to come back (say, to a larger venue with time for publicity).